The market is filled with millions if not billions of devices. The most common are obviously our mobile phones, the smart phone in particular. As ‘smart’ as they are, smart phones are not capable of satisfying some of the needs of the people. Needs such as physical and health fitness cannot be attained solely via the mobile phone. Due to this short coming, advancements in technology have led to the development of activity trackers. However, many of the activity trackers in the market work as mere timers to remind you of when you should work out in addition to the usual step counting. Mushroom Labs has come up with the perfect activity tracker. Moov goes beyond merely reminding users of their exercising schedule. This amazing wearable devices works not only to monitor your activities, but also to keep track of the quality of your workout. The Moov activity tracker comes with two types of straps. The ankle strap is used when the wearer intends to wear the tracker on the ankle while the wrist strap is used when the device is being worn on the wrist. The position in which the device is worn depends on the type of activity being performed. Moov activity tracker is compatible with a variety of devices all of which should be running on an iOS operating system. The future also looks bright for Android users with developers of the Moov working on spreading its compatibility to the said OS. This wearable gadget connects to compatible devices via Bluetooth. This wireless connection enables the gadget to send real time data to smart phones. This data is then analyzed and displayed on the screen for viewing. How Does the MOOV Activity Monitor Work? 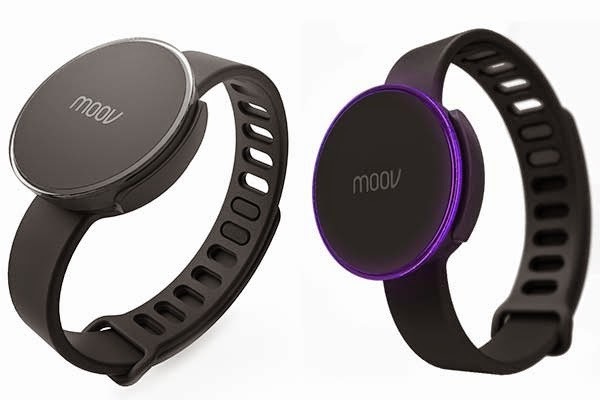 The Moov can be worn either on the wrist or the ankle. Footwork activities such as walking and running require the device to be worn on the ankle. This is because the feet feel the full effect of these activities. Activities that require a lot of hand engagement will result into the gadget being worn on the wrist. Once in place, the app is activated. The individual can select from a variety of programs depending on what they intend to concentrate on. The data is then collected and wirelessly transferred to the smart phone where the app analyzes it. As a final step, the data is displayed on the phone’s screen. The Moov activity tracker is a combination of two major parts namely the straps and the core. The core, which is also the main part of the device is slim and round in shape. This accompanied with the straps give the gadget a watch-like resemblance. So, what exactly is contained in the core? The accelerometer is responsible for keeping track of the activities performed. It monitors activities performed on a horizontal plane. This means that the activities are either to the front, the back or sideways. Such activities may include walking, swimming and running. Not all activities are performed on a horizontal plane. Some of the activities are performed on a vertical plane. Activities performed on this plane are monitored using the gyroscope. Activities such as paragliding fall under this category. The magnetometer is used to determine the directions in which each of the activities is performed. Coupled with the above instruments, the magnetometer has the capability to determine the type of activity being performed. The above three features in unison enable the device to fully reconstruct your movements on a three dimensional space. This enables you to view your workout sessions in real life experience. This means that the device is partially waterproof in the sense that it allows wearer’s to swim in it, but it does not support diving. The Moov comes equipped with a built-in rechargeable battery. The device is charged through a USB charger. What Should You Expect from the MOOV Activity Tracker? Calculate the amount of calories burnt by the wearer throughout the workout sessions. Keeping track of the activities performed. Offering suggestions that are most likely to assist the wearer attain their set goals. This will help the wearer to achieve their desired results much more quickly and easily. Having a wearable device that tells you how you can improve on your workouts to achieve the best results is your best companion to a healthy, fit body. Many customers were impressed with the level of accuracy the device had to offer. However, many were a bit disappointed with the fact that Moov lacked a heart rate monitor which could come in handy during analysis of the data collected as well as the recommendations made to better the results. It is no secret as to why many people are fans of the Moov. The accuracy exhibited by the gadget is unlike any other in the market. The device gives extensive information on the wearer’s workouts to help them identify the areas that require more work. The Moov may look like a common watch but its functions are weigh beyond any other wearable gadget can achieve.